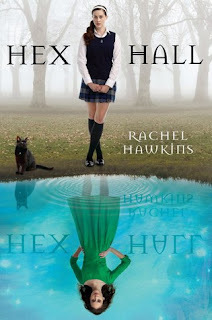 The US cover of Hex Hall is now featured on Goodreads and the author's website and Amazon uk is showing the following cover for the UK release. I've got to say I REALLY like the US cover - I just find it really appealing. I think the UK one is okay but just doesn't have the same impact. I agree I prefer the US cover. I can't relate to the UK one at all. It looks like St Trinians or something. I didn't even realise that Hex Hall was coming out over here! I prefer the US one, though. Doesn't the UK cover make you think of the film "The Craft"? I like both, but I think I like the us cover the best. US is definitely better. I mean, the UK one is cute, but US looks so much better. The reflection bit is probably the part that swayed me the most. I'm with you - I really prefer the US cover. Love the cat! To me the UK cover looks like another snobby clique-y book - and I'm not really a fan. You really have to see the spanish cover. It's kinda different, I really love it!